Looking at things in a new way. That is the sign of an innovator and the calling card of legendary performers. How can things be better? How can a process be improved? When it comes to motorcycle gear, Dainese is relentless in their quest to figure out such things, and with the new Dainese Race Pro In Gloves, they are showcasing that thought process in full force. The Race Pro In Gloves are built to offer a new take on track day hand protection. Traditionally, race gloves have been seen as something that one would wear over the top of their race suit cuffs. 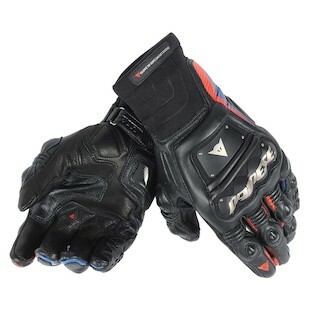 However, with the Dainese Race Pro In Gloves, that notion is being challenged. These gloves affix to the interior wall of your race suit cuff by way of Velcro connectors. In doing so, you are left with a highly secure fitment that some feel offers a more ergonomic range of motion and interaction with the controls. Aside from the “in” nature of the gloves, they are as ardently defensed and expertly constructed as you would come to expect from Dainese. From the distortion control pinky finger feature, to the composite inserts that reside in the stainless steel and thermoplasic resin along the top of the hand, the Dainese Race Pro In Gloves are a full-force track-day set of hand holsters. So, if you are the adventurous type (and if you are going to track days, that is a likely probability), think about the benefits of an “in” glove and check out the new Race Pro In from Dainese.